We’ve just completed a new paper on improving paper-intensive business processes. Among the topics covered is how integrating document imaging with the systems underlying BPM, and performing document scanning at the front-end of business processes, organizations can develop a bridge between the paper work and the electronic work that improved productivity and enables continuous improvement of business processes. and drive business processes, it is the business applications that both execute the steps within the processes, and that contain and manage the content and data. Cross-platform document imaging solutions provide the necessary integration points to include paper-based information into the electronic workflows managed by BPM suites. Additionally, the paper includes an overview of some of the typical business problems caused by paper-based processes and discovery questions that can be used to identify these problems. Clearly, identifying and dealing with paper is only one step in process improvement. But without addressing paper-based processes, any BPM initiative will leave a large process improvement opportunity on the table. What is your ECM Maturity? I just came across a great resource for enterprises who are looking to better understand how mature their content management strategies and systems are, and help build a roadmap towards the highest level of maturity. The Enterprise Content Management Maturity Model (or ECM3 as it is being coined), is in its early stages, but nicely breaks out maturity measurements into 13 dimensions across three categories: Human, Information and Systems. I’ll be keeping an eye on this organization as they continue to build out this model, which will in turn, help improve business processes and document workflows. In the meantime, the initial model is a very eye-opening read and will help you assess your current situation and map out your next steps. And if you are interested, they are also looking for participants to join the “Guiding Consortium”. To be considered, visit this page. As promised, here’s a couple of things I gleaned during last week’s AIIM seminar in Boston. If you missed the roadshow and are interested in learning more about Document Imaging, SharePoint and BPM, register for the November 19th AIIM webinar. SharePoint adoption is still growing, but it has not yet moved past a collaboration and document library/portal tool in most organizations. Pretty much every ECM vendor has built integration into SharePoint and is happily co-existing. SharePoint does not seem to be a threat to ECM technology vendors. Records management is the major area where SharePoint lacks functionality to compete against ECM solutions. Good information, but nothing earth shattering. What resonated with me, however, was Carl Frappalo’s keynote about BPM. He noted that when undertaking a Business Process Management initiative, technology considerations are secondary. Instead, it is all about understanding your business workflows at their most granular level and determining where the inefficiencies lie. Only then can you begin to improve those processes through re-design and, sometimes, technology. For example, we have a customer that was spending well north of $100K each year retrieving invoices, checks and other financial documents for use by auditors. 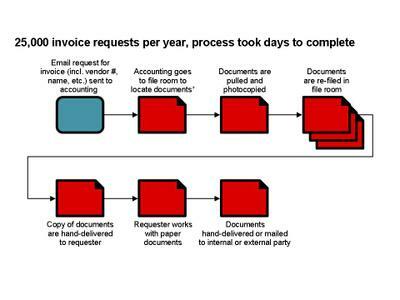 The images below represent the before and after workflows for invoice retrieval. Note that in this “before” workflow, most steps are colored Red, indicating that they are paper-based. The only electronic step is the first one…meaning that this workflow originated electronically, but then reverted to paper-based. Definitely not a path to business process efficiencies! In the “after” workflow, the invoices are scanned at the beginning of the workflow process, enabling the rest of the workflow to be completed electronically. As important, the process is now “self-service”; eliminating the need to engage the A/P department for standard invoice retrieval tasks. The result of this single workflow change and the elimination of paper early in a business process? $100K+ in cost savings and a reduction in process time from days to minutes!! Just think about how many processes in your organization could be improved simply by identifying areas where paper intersects with a business process. I’m headed down to Boston tomorrow for the AIIM seminar: "Automating Document-Centric Processes: Is SharePoint Enough?". I’m looking forward to hearing from vendors and end users alike about how far SharePoint has actually come in terms of Business Process Management and Business Process Automation. There is little question that SharePoint adoption is still hot. In fact, at our Paper Connection Forum last week, 4 of our 6 Best Practices winners are in the process of rolling out SharePoint or are already using it enterprise-wide. However, the big question seems to be whether the technology can move from a hosted document library and collaboration tool to a technology that sits at the core of business processes. For example, of those customers at our event last week that I mentioned, every deployment of SharePoint was focused on collaboration and content management, not business processes. I think a big part of this is a lack of understanding and I hope that tomorrow will shed some light on the topic. What do you think? What have you observed? And what would you like to find out about it? I’ll be writing a post following the seminar and would be interested to compare your thoughts to those of the seminar attendees. And if you are interested in more information on this topic, please register for the November 19th AIIM Webinar, Automating Document-Centric Processes within SharePoint. This acquisition is further evidence that capture – one of the primary elements of ECM according to AIIM – is continuing to be looked at more closely by major ECM players, especially in terms of front-end capture. ECM vendors recognize the need to let any office worker add paper-based information to their applications. It is no longer good enough to just offer a batch or production-type imaging solution for ECM systems. Front-office workers have access to scanning devices, and organizations are recognizing that serious efficiencies can be realized by letting them scan paper-based information earlier in business processes -- eliminating the need to move paper within an organization and making that information available earlier. And just as we talked about last week in regards to selecting document imaging software that can be used across multiple scanning platforms, the same is true for integration with back-end systems. So, you want to look for a document imaging solution that can integrate with multiple back end applications, providing front-office workers with a common interface at their scanning devices for capturing and distributing paper-based information. Thank you Peter Hagopian, for expanding the reach of the eDOC Magazine article “Making a Case for Content Management” in InformationWeek’s Content Management Blog. Numbers always make for a compelling story, and the City of Torrance is a terrific example of how removing inefficiencies from document workflows can have a major impact. A $500,000 annual return on a $100,000 investment is tremendous – and is especially nice to see when taxpayer money is impacted! 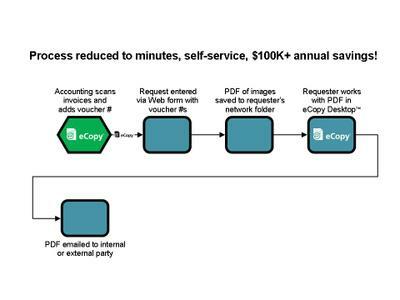 A big reason that the City of Torrance was able to get this level of ROI from their solution (eCopy, Rainmaker & Interwoven) was due to the fact that they identified document imaging as a core part of their content management solution. Falling into the trap of implementing a document or content management system to handle electronic documents but ignoring the amount of paper that exists in an organization is a sure way to see diminishing returns on that system. The paperless office is still only a vision, and paper continues to be an important business tool. The challenge, perhaps, is not to create a paperless office, but to create an office where paper and digital documents are woven together in an efficient, cost-effective and easy-to-use workflow that revolutionizes the way people work. This is what the City of Torrance has done to great success by including document imaging as part of their content management solution. To read more about their success, download the case study. AIIM, the Enterprise Content Management Association, just launched a new online community, Information Zen. Big kudos to AIIM for starting this up and I'm pledging to be active in the new community, as well as to get my colleagues involved. Take a moment to poke around the site...it has great information on all things ECM and information management and will hopefully turn into an active community! A big reason that I am excited about this new community is that it is another resource for both end users and vendors to discuss challenges, successes and best practices around ECM. As we all know, ECM is a big umbrella and includes document imaging as a subset. At eCopy, we've started this blog and the Document Imaging Wiki to provide a similar, central resource for document imaging. I'm hoping that we can create lots of back and forth between our Web 2.0 initiatives and AIIM's...providing awareness of document imaging within the ECM conversations and offering a place to come and learn more about specific document imaging-related information in our blog and wiki. These Web-based resources are a tremendous asset to our industry and a big thank you goes out to AIIM for continuing to increase awareness and spur conversation. There are three dimensions of this problem that we need to help organizations understand. The first is the traditional one – getting rid of paper. The second dimension relates to getting rid of paper from information that was actually born digitally. We have a tendency in the work of blogs and wikis and Enterprise 2.0 technologies to somehow imagine the paper is a thing of the past… And lastly, I think that part of the renaissance of paper concerns in organizations will center around green concerns. I agree with all three dimensions, but think that a fourth needs to be added to that list: information access. John references this as one of the four major trends in ECM, but in an echo of what I hear from end user organizations, he focuses on electronic information access. For organizations to capitalize on the value that applications like SharePoint and other document tools the reach the desktops of workers across an organization, electronic and paper-based information need to be merged together in these new workflow processes. Providing all employees access to an easy to use document imaging solution can help meet this goal. Microsoft posted a SharePoint customer case study article today on the Microsoft Momentum site. The article features eCopy document imaging software customer Introgen Therapeutics, a biopharmaceutical company that used SharePoint and eCopy to meet government regulations. The author, Alan Earls, discusses how eCopy duplicates the Microsoft SharePoint user experience at the MFP. To read the article click on Microsoft SharePont document imaging.